30-year-old man with palpitations after a night of partying. This rhythm is a rapid irregularly irregular rhythm at about 170/minute. It is mainly a narrow complex tachycardia, with seven wide beats of a different morphology. 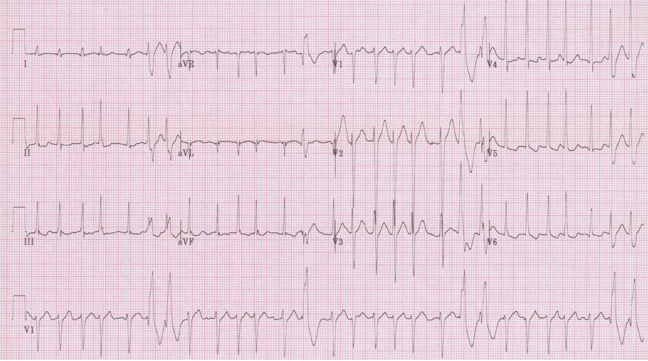 This rhythm is rapid atrial fibrillation. 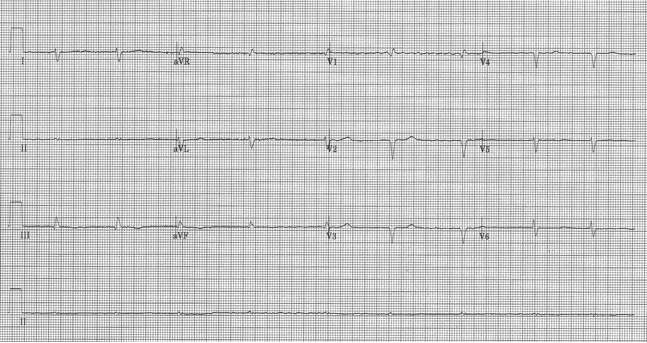 The wide-complex beats could be PVCs or, in the setting of rapid atrial fibrillation, Ashman’s phenomenon would suggest these could be aberrantly conducted supraventricular beats. Ashman’s phenomenon occurs because the repolarization period for any QRS complex is proportional to the R-R interval preceding the complex (bradycardic rhythms with longer R-R intervals have longer QTc intervals). Therefore, when a relatively long R-R interval is followed by a short R-R interval, that third beat may find part of the conduction system refractory – in fact, usually the right bundle (the longest bundle) is the refractory part of the conducting system, and the resulting aberrantly conducted beat will have a RBBB morphology (tall R wave in V1). 1. The ST-segment elevation, when closely scrutinized, is partly due to PR-segment change from the baseline. This is most clearly seen in leads II and I as PR depression. 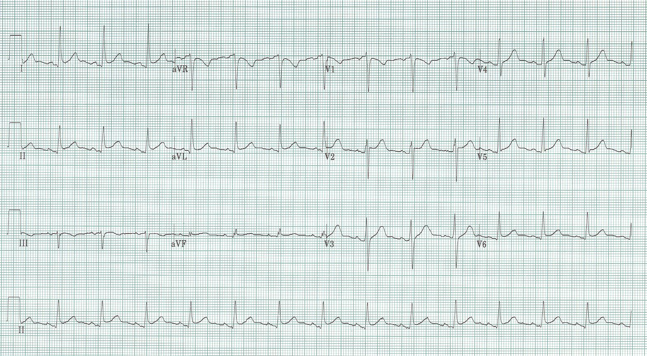 There is also PR-segment elevation in lead aVR, an additional described sign of pericarditis. 2. In the lead II rhythm strip there is downward trending of the T-P baseline, also known as Spodick’s sign. 3. ST-segment elevation in lead III > ST elevation in II suggests acute ischemia. 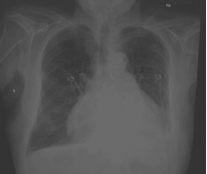 Hopefully you were concerned with the possibility of a large pericardial effusion, or even tamponade, with the low voltage on the EKG, some aspects of the physical exam, and then the “waterbottle” cardiomegaly on CXR! The next step in managing this patient was bedside ultrasound (not pericardiocentesis as hemodynamically stable). Bedside ultrasound revealed no pericardial fluid but a massively dilated right ventricle?! 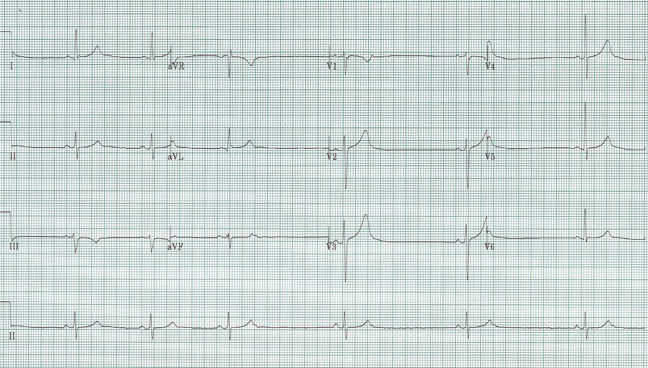 64-year-old woman with intermittent lightheadedness. This rhythm strip demonstrates something deforming the terminal portion of the T wave that precedes the beats of the slower rate (arrows). The deflect that deforms these T waves is a very early atrial beat, a premature atrial contraction (PAC), that is so early that the conduction system is not yet ready to accept a premature beat – thus what we see here is bradycardia simulated by blocked PACs occurring in a bigeminal pattern. in sinus rhythm is a blocked PAC!